Why Choose an Aqua Patio Pontoon Boat? When you choose to invest in a pontoon boat, there are some key qualities that you’ll be seeking. For starters, you want a boat that’s going to be versatile in its capabilities. You’re also going to need outstanding performance, superior design, and maximum comfort. Aqua Patio pontoon models offer you all that and more! As for variety, there will be no lack of options when you choose to go with Aqua Patio pontoons. With more than 20 models to choose from, you’ll have no problem finding the right option for your on-the-water lifestyle. The real challenge will be narrowing it down to just one! You’ll boat with confidence knowing that Godfrey Pontoon Boats developed and manufactured your Aqua Patio pontoon model. After more than 50 years of experience, it’s safe to say that Godfrey has perfected the art of the pontoon boat. You’ll love having the sporty, edgy design that comes standard with any Aqua Patio pontoon boat. What’s more, you’ll never have to sacrifice performance for an ultra sleek design. 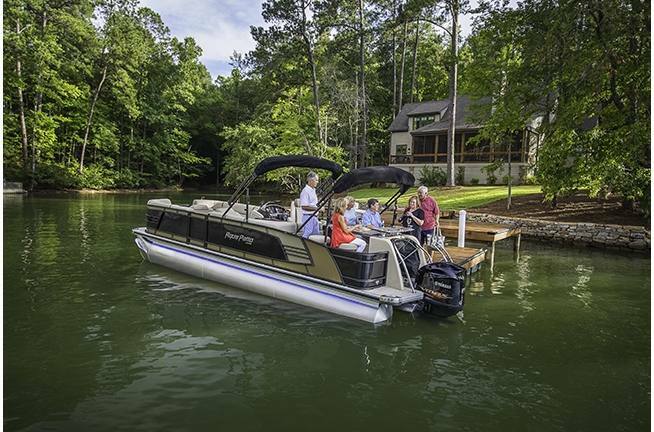 Visit Hughes Marine Service today to check out our complete selection of Aqua Patio pontoons. We are conveniently located in Danville, VA. We’re proud to offer sales, service, and parts on Smith Mountain Lake, Leesville Lake, Claytor Lake, and Buggs Island Lake (Kerr Reservoir).